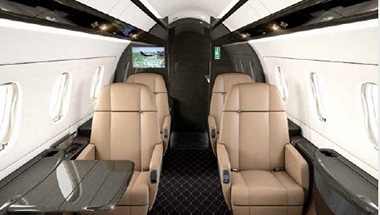 Starting with a clean sheet of paper, Embraer designed the Legacy 450 as a new state-of-the-art corporate jet that transcends all others in the mid-light class. It is truly a remarkable union of technology and design. 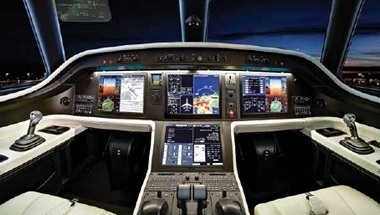 As a direct challenge to convention, the Legacy 450 is the only jet in its class to replace standard controls with full fly-by-wire technology - offering complete envelope protection and reduced pilot workload in a dark and quiet cockpit environment featuring superior ergonomics, large displays and a synthetic vision system. An innovative side-stick control helps deliver an exceptionally smooth flight. At 6 ft tall and 24 ft long, with a flat floor, the stand-up cabin is the tallest and widest in its class as well as a setting of luxury including robust entertainment and connectivity, a low 6,000-ft cabin altitude, and the only wet-galley option in the mid-light class. Seating for a total of nine passengers includes two centre club seats that fully berth to create beds. A combined internal and external stowage capacity of 150 cu ft is by far the largest in class. 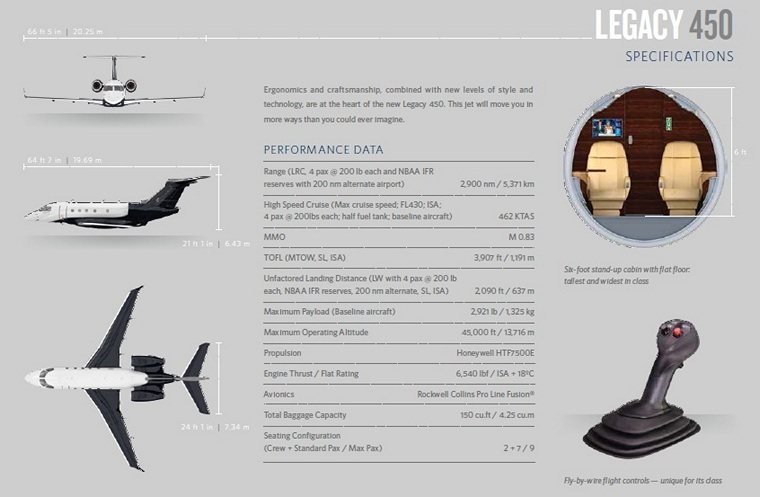 With a High Speed Cruise of Mach 0.82, the Legacy 450 is the fastest mid-light in the air but also negotiates short runways for broader access to airports worldwide. It can climb directly to 43,000 ft. in only 21 min, departing from sea level with maximum take-off weight - the kind of performance that comes with redefining what's possible.